A real ale pub on Southwark Street near London Bridge Station, run by the Red Car Pub Company. 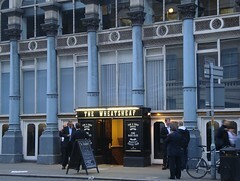 It used to be called The Wheatsheaf, and was located around the corner on Stoney Street, but moved location in early 2009 when the original building was closed for work associated with the Thameslink upgrades. As of December 2012, Young's had reopened at the original location, and LondonSE1 reported that the Southwark Street pub was now advertising itself as "the one true Wheatsheaf — accept no imitations!". However, as of October 2013 it appears to be calling itself The Sheaf — this is the name on the A-board outside photo, though when we walked past the frontage was being repainted and there was no name on it. In any case, this version is now in the cellars of the Hop Exchange, where the Hop Cellars used to be. Pleasingly, they've brought along all the portraits of the regulars that were taken just before the old incarnation closed, and these now line one of the walls. Befitting its nature as a cellar, it has a low arched ceiling and stretches back a long way. Unsurprisingly, there's no natural light. The lighting is a little unfortunate; harsh spotlights shine in your eyes while doing little to dispel the gloom. Some of the space is broken up with narrow wood-panelled screens, and there's a sofa area to the right as you enter. There's also a dedicated dartboard area photo; bob recalls that this part used to be filled with tables when it was the Hop Cellars. Kake, bob, and Phil visited on a Thursday evening in May 2009. Nine real ales were on offer, including a mild. We think they were all £3.10/pint apart from the Red Car Bitter, which was £3. The flatscreen near the door was showing football on Sky Sports, with a rapt (and occasionally raucous) audience of men in suits. The place was quite full, and remained so throughout our visit. bob visited on a Sunday afternoon in July 2010. There were a few customers in and they were showing the F1 Grand Prix on the TVs. I had a decent pint of Beartown Peach Melbear (£3.25). There were lots of other beers on, although there is one faux pump clip to confuse people. Food is served lunchtimes only; noon-3pm Mon-Fri, 1pm-4pm Sat, and 1pm-5pm Sun, according to a board seen outside in May 2009. Accessibility: Half a dozen steps down to get in, but it's all on one level once you're in. Last visited by bob, 11 July 2010. Last edited 2016-09-18 15:55:34 (version 19; diff). List all versions. Page last edited 2016-09-18 15:55:34 (version 19).